Tegucilgalpa the capital of Honduras, the home of Izzwa Medina, the first ever player from Central America to compete in the table tennis events at an Olympic Games, when in 2004 she was on duty in the Galatsi Stadium in Athens, the city was the recent home for an ITTF/PTT Level One Coaches Course. Organised under the auspices of ITTF High Performance and Development, in liaison with the Honduras Table Tennis Federation, proceedings commenced on Saturday 6th October and concluded on Wednesday 10th October. Pertinently, the expert on duty was Venezuela’s Luisana Perez, likewise on duty at the Athens 2004 Olympic Games. In the capital city of Greece, partnering Fabiola Ramos in the Women’s Doubles the duo was not showered with great success; in Tegucilgalpa it was the very opposite, there was a deluge. A red alert was issued by the Honduran National Government, owing to the heavy rains that had caused floods in Tegucigalpa following hurricanes that had hit the region; undaunted no less the 29 coaches braved the elements. Notably amongst the group seven women, two from Nicaragua, in particular impressed Luisana Perez. The itinerary comprised a total of 30 hours, two sessions of three hours per day for five days, the programme involving both theory and practical sessions. A successful course, one person in particular being delighted; the very amiable and always welcoming Leonel Godoy, President of the Honduras Table Tennis Federation, he was most grateful for the efforts of Luisana Perez. 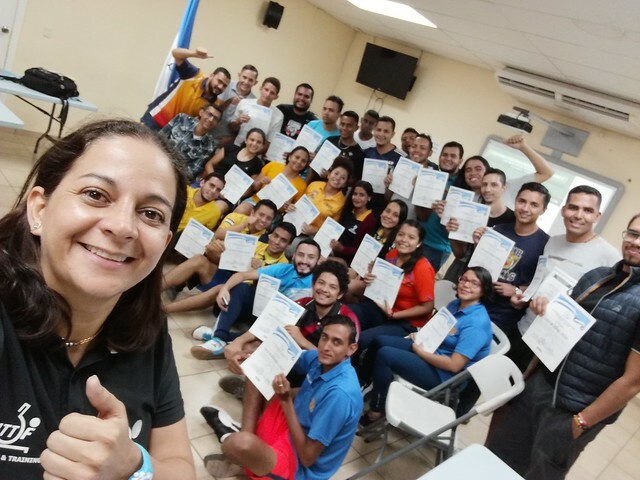 A successful Women’s Course completed late September in Costa Rica, now an equally profitable venture in Honduras but there is no rest for Luisana Perez. It is a journey to the other side of the world. She travels to Japan to join the Latin American Team at the ITTF World Cadet Challenge; play starts in Tottori on Tuesday 23rd October.